What Kind Of SPAM Do You Receive? Today, I receivedÂ the following email.Â As I was about to press theÂ delete button, I couldn’t help butÂ ask myself if people actually respond to these type of messages.Â Have you received something similar to this? Sweetheart, if suddenly the Sun will stop shining, you will keep me warm! will separate us.Â Because two of us will be the strongest power ever known. our opportunity to be happy, dear. It literally takes five minutes just to read it due to all of the spelling and grammatical errors in the message. You’ve got to be a mind reader just to understand what the point of the message is. SpamBully has been doing a great job of filtering out the junk mail that I receive on a daily basis. On average, I get about 60 SPAM messages per day, either from a “long lost lover”, a “Nigerian prince” who needs me to transfer his fortune through my bank account, or from a “Canadian pharmacy” website. At first, you would think that there is no possible way anyone ever believes these messages or responds to them, but if that were true, why would so many people spend so much time and money sending out these messages? What sort of SPAM do you usually receive? How many people do you think actually respond to them? 5 people had something to say. What do you think? RSS sponsors will have their link displayed after every single post in our full content RSS feed along with a 30 word description of their site. No more than five RSS sponsors are allowed at any time. The cost is only $5 per month! To reserve your sponsorship, all you have to do is send $5 via PayPal to jrobinson@sitefever.com along with your URL, anchor text and up toÂ 25 word description of your site. Act fast- only five spots are available! To read about all of our advertising opportunities, visit our advertising page. This is in follow-up of part 1 of our August monthly update. Part 1 mostly covered the monetary aspect while this part will outline how things went from a traffic and popularity aspect. 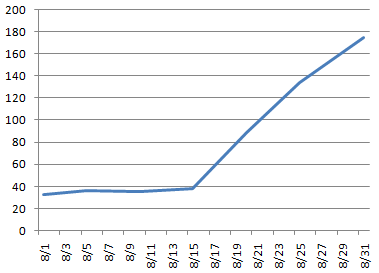 AwStats reported 8,123 unique visitors and 463,126 total pages viewed for August. 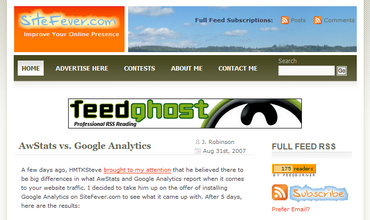 Google Analytics was not installed on SiteFever until the end of the month. However,Â our AwStats vs. Google Analytics report on August 31 showed that Google showed an approximate 25.7% difference in traffic over AwStats. Using that percentage, we can estimate that if Google Analytics had been tracking our stats all month it would of reported approximately 6,035 unique visitors and 34,102 monthly page views. 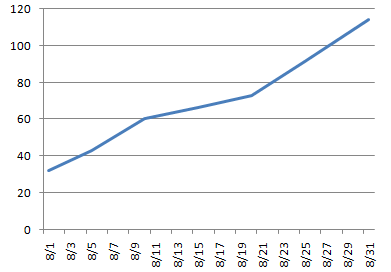 All of the stats showed over a 300% increase throughout the month while our RSS subscribers increased over 500%. 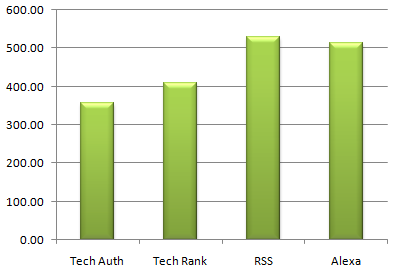 We hope that our RSS subscribers continue to increase each day. My purpose in showing all these stats and charts is twofold. First, some of you simply ask me to show them- a fewÂ are just curious and others are interested in advertising and would like to see how well the blog is doing. Secondly, I really want to stress the importance of tracking your progress over multiple channels. So many blog owners have been caught up in the PageRank frenzy and have forgotten to pay attention to anything other than a numberÂ that Google assigns them 4 times per year. I strongly recommend that you make yourself a spreadsheet and track your stats on a daily basis. 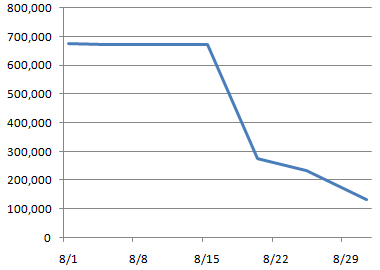 With just a few clicks, you can easily make yourself a chart to visualize how your blog is doing from day to day. This will help you quickly spot any areas of your blog that you may need to put a little more emphasis on. May I Present The New SiteFever Theme! It was a free theme, so SiteFever wasn’t the only kid on the block with that look. Judging by the popularity of this blog in its first two months, I felt that it needed its own “brandable” layout. I moved the site wide 468×60 ad spot from the center of the screen to the top right. This still allows the banner to be displayed at the top of each page while leaving me enough room to place a really sweetÂ logo thatÂ Julien from TheWebsiteProfessionals.comÂ helped me to create. There’s also room for some decent sized RSS buttons and popular articles without having to bump the main content down too much. Although “whitespace” is a good thing, the old theme was letting a TON of space go to waste. I widened not only the content area but also the sidebar, which now allows room for two 125×125 banner ads side by side. As you may already know, I really like to push for reader participation on SiteFever, so I have done quite a few things to help. In addition to removing the nofollow attribute from the comment links, MyAvatars plugin and the top commentators plugin,Â I also added the subscribe to comments plugin which allows you to receive automatic email notifications when somebody replies to a topic you left a message on. Also, Brian’s threaded comments plugin allows you to reply to specific comments rather than having all the comments being grouped together, which will be a big help especially with the larger number of comments we have been seeing on SiteFever. To top things off, you will also notice that I added the recent comments plugin, which displays the most recent comments in the sidebar. I decided to move the recent MyBlogLog avatar box down to the footer because as some of you already know, MyBlogLog can get a little goofy a few times a week and take a while to load- or not load at all. I did make the avatar box bigger so it will display more recent visitors than it did before. There are some other tweaks I did to the site to make it load faster than it was- or would have with this theme. 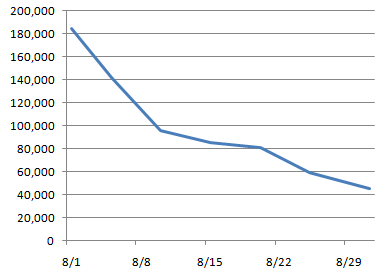 I will write a post on what steps I took to decrease my average page load time by almost 40%. Anyone who owns a website or a blog should check back to see these tips because speeding up your page load time is something that everyone should want to do. As much as I might have thought this redesign was necessary, I am anxious to hear what everyone else thinks about the changes here at SiteFever.com. Please let me know what you think! 28 people had something to say. What do you think? I know there are a few days left in August, but I wanted to go ahead and give you an update on the in-house income report for this month. The ad with the highest CTR was the sitewide header banner with aÂ 1.80% CTR.Â My goal is toÂ do all that I can to increase the average CTR on this blogÂ to at least 2%, although much of that depends on your ad. I’m sure when given an entire month to calculate, we will reach our goal of $1,000 per month without using ad networks or affiliate links. This sure beats the $6.78 received for the entire month of July using AdSense and Kontera! Don’t forget that you still have two more days to take advantage of matched deposits for advertising on SiteFever.com. Since I removed all ad networks from this site, I have seen a lot of talk going around from bloggers who are interested in doing the same. I strongly encourage you to give it a try! Just be sure to set a fair price for any ad space you offer. As a side note, I am currentlyÂ rounding up some contest sponsors to give out some valuable stuff on SiteFever in the near future. So far, the sponsors I’m talking to are willing to offer prizes such as software, t-shirts and some nerdyÂ gadgets. If you’re interested in sponsoring a contest on this site, please contact me. 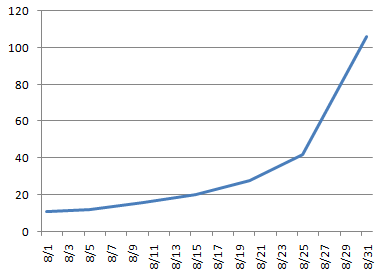 On September 1 I will post July’s traffic stats, so stay tuned. Come Get Some Free SiteFever Money! You deposit $20 to use for advertising, you get $40. If you deposit $50, you get $100 and if you deposit $100, you get $200! What you have to do is create an advertisers account. Using PayPal, you can deposit any amount of money you want into your account. You don’t have to use it right away. I will match any money deposited up to $100 per person until September 1. 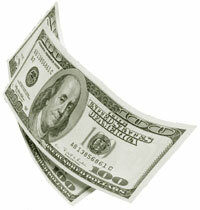 The funds in your advertisers account can also be withdrawn to purchase a site review. You can read all the details about advertising on this blog from the advertising page. Once you deposit money into your account, please allow me a few hours to add the additional funds. Blogger Users- What Are You Thinking??? Blogging is not a one way street. In order to operate a successful blog, you’ve got to promote reader participation- commenting. 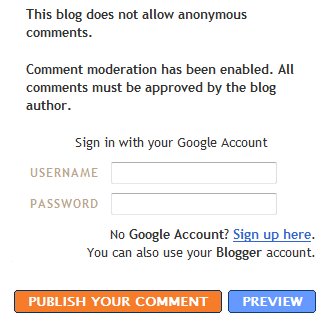 What on earth would drive you to require anyone wishing to comment on your blog to create a Google account? I can’t even count the number of blogs I have visited in the past month that I went to leave a comment on, noticed the above message, then promptly exited the site. Do yourself a favor and allow anonymous comments on you blog. As soon as you do, your reader participation will surely increase. 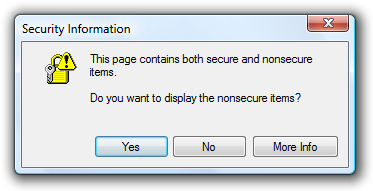 As far as the http/https security pop-up goes, you can either ask all your readers to change their Internet security settings so they will no longer receive this notice, hope your readers don’t mind, or locate some other solution. When designing their online stores, huge corporations will spend millions of dollars to develop their site to allow the customer to go from item selection to checkout in the fewest possible steps. When managing a blog, reader participation is the equivalent of an item checkout for an online store. When developing your blog, make it a point to allow the reader to easily participate! If reader participation remains difficult, you will lose your visitors and your blog will turn intoÂ a ghost town.